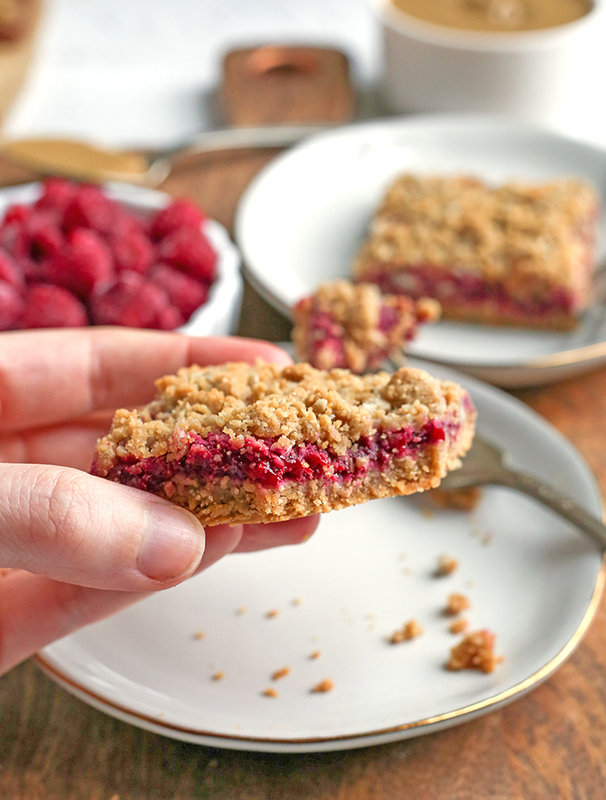 These Paleo Vegan SunButter Raspberry Crumb Bars are nut-free and so delicious! 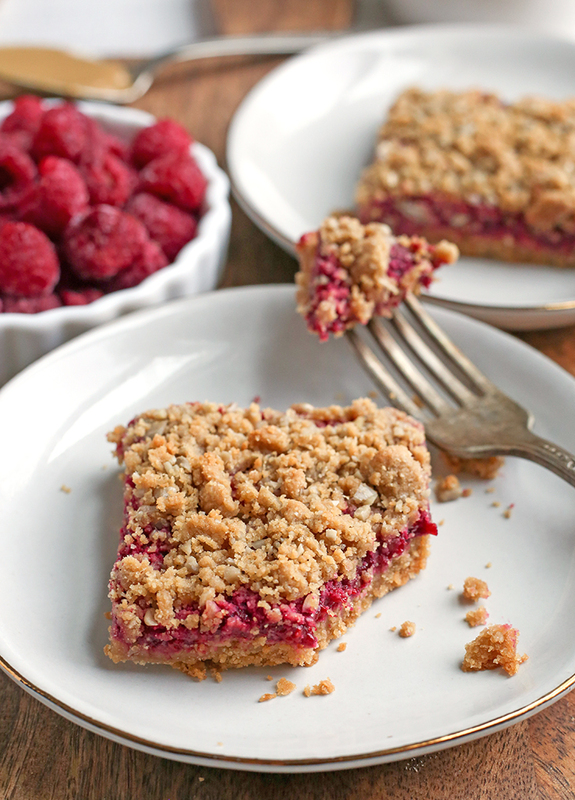 A shortbread crust, fresh raspberry filling, and simple crumb topping. They are gluten free, egg free, dairy free, and naturally sweetened. 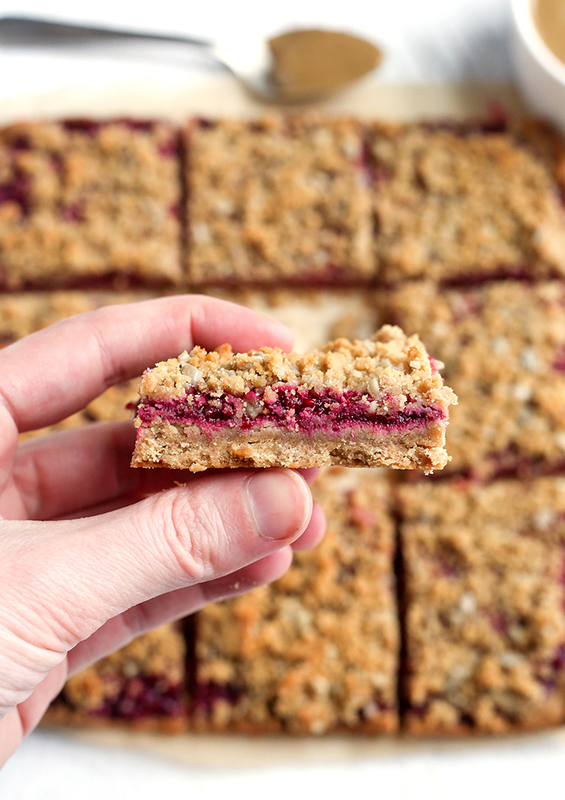 I love making crumb bars and I have a lot of different varieties on my site, but none of them are nut-free and I know that’s a common need. Coconut flour is used as the base and No Sugar Added SunButter is combined with it to make it so tasty. 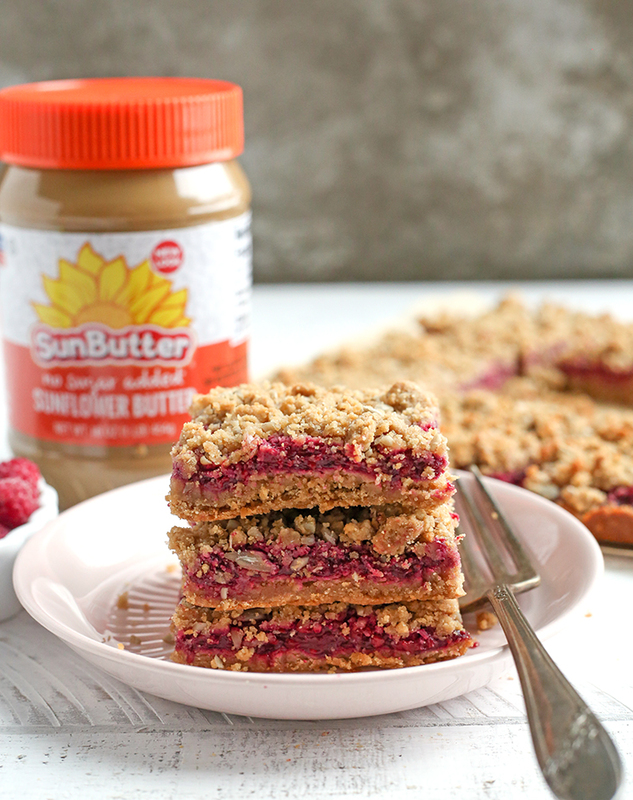 SunButter is free of the top 8 allergens so you can feel confident eating and serving these. It also makes them school friendly. 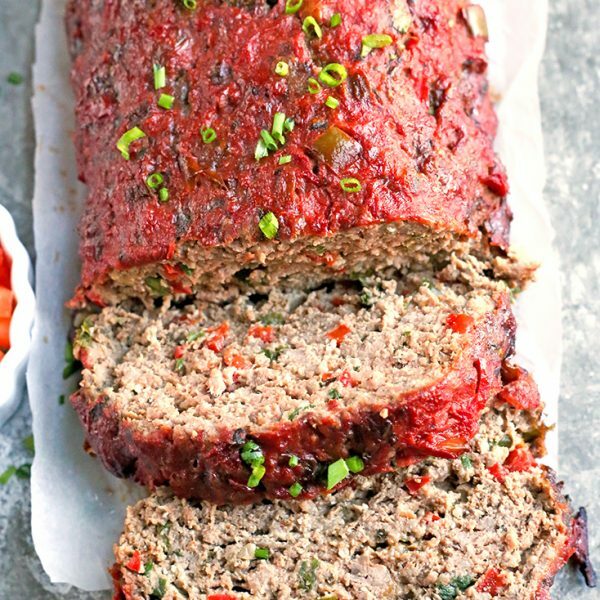 Your kid would love these in their lunch box! Making desserts low FODMAP can be tricky, but these have ingredients that work as long as you stick to one piece. I didn’t actually calculate it, but coconut flour is a limit food, so 1 piece is safe. They’re sweetened with maple syrup which is a low FODMAP approved sweetener and of course SunButter is low FODMAP. These bars are so easy to make! The shortbread is mixed up quickly and 3/4 of it is pressed into a pan and baked. While that makes you make the raspberry filling. I used frozen raspberries, but fresh can be used as well. That only takes about 7 minutes to make and thicken. It’s spread over the shortbread the crumb topping is added and they’re baked a little longer. Nothing hard at all! 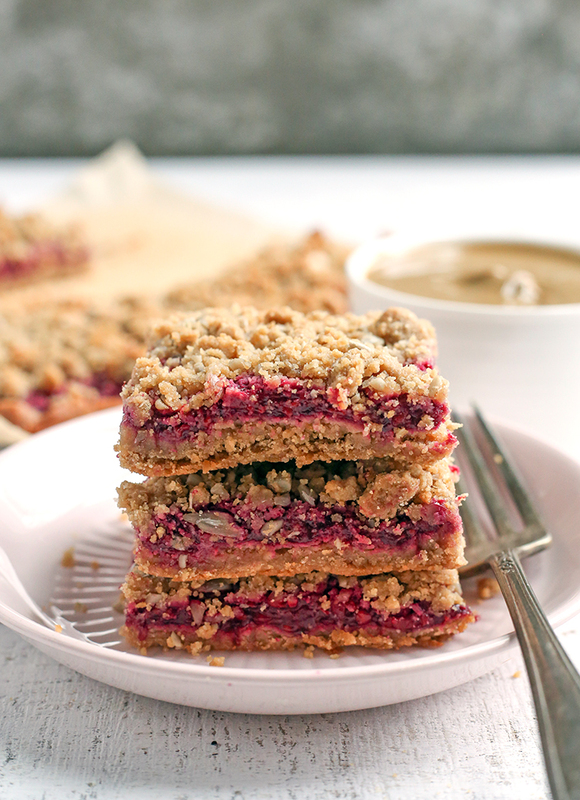 That fresh layer of raspberry filling pairs so perfectly with the SunButter shortbread and crumb topping. 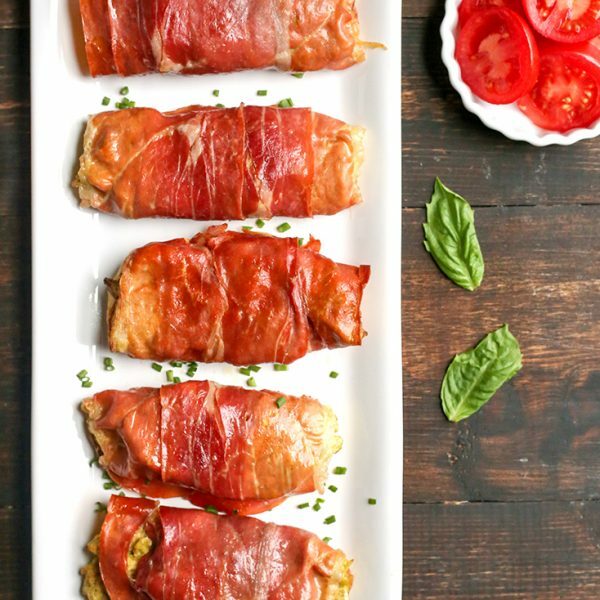 They are so delicious and I know you will love them! 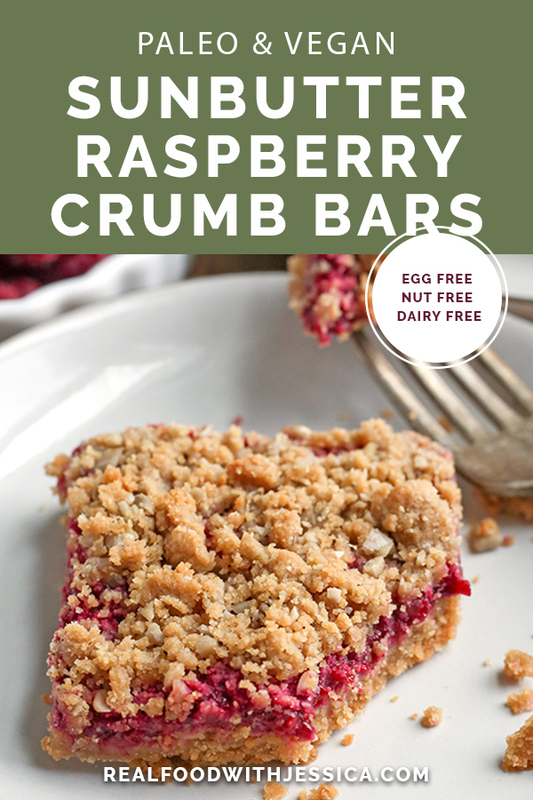 Here are some more crumb bars recipes: Paleo Raspberry Crumb Bars, Paleo Apple Pie Crumb Bars, and Paleo Blueberry Pie Crumb Bars. Preheat oven to 350° and line a 8x8 (or 9x9) pan with parchment paper. Set aside. Make the shortbread. In a large bowl, combine the coconut flour, SunButter, maple syrup, and vanilla. Mix well until everything is combined and no dry spots remain. Press 3/4 of the mixture into the bottom and bake for 10-12 minutes, until the edges are lightly brown. While the crust is baking, make the raspberry filling. Add raspberries, maple syrup, arrowroot and salt to a small saucepan and cook over medium heat until thick- about 7 minutes. 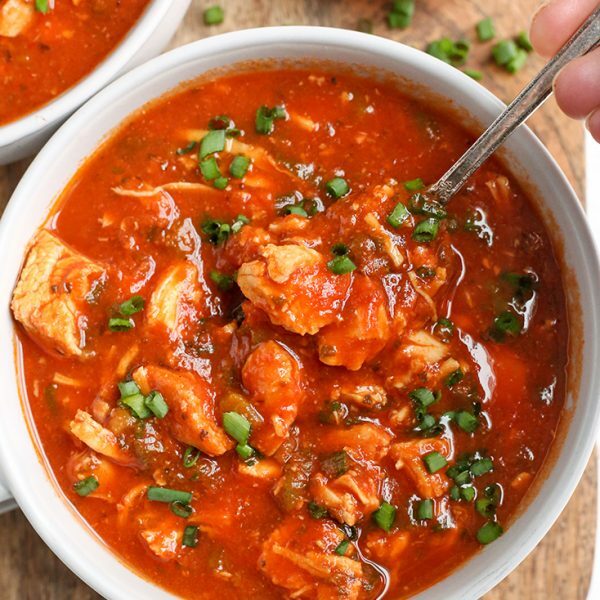 Stir regularly and help break up the chunks. 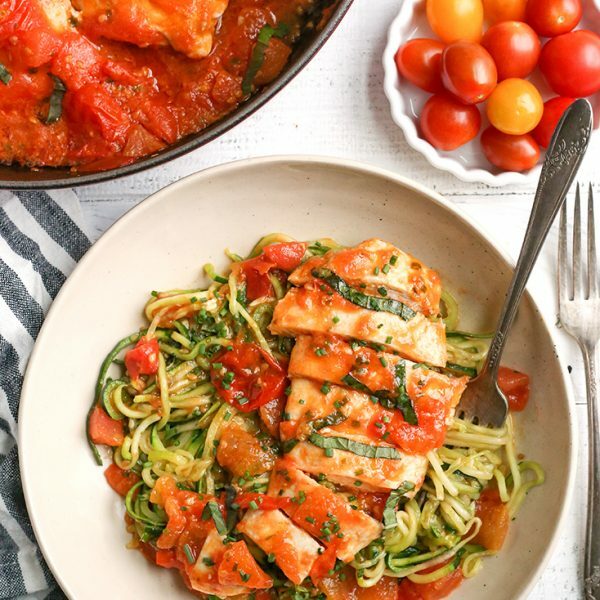 Pour into a bowl and place in the fridge until needed. Make the crumb topping: combine the remaining shortbread mixture with the chopped sunflower seeds and mix well, until crumbly. Once the crust is done baking, remove from the oven and let cool 5 minutes. Spread raspberry mixture evenly over the crust. 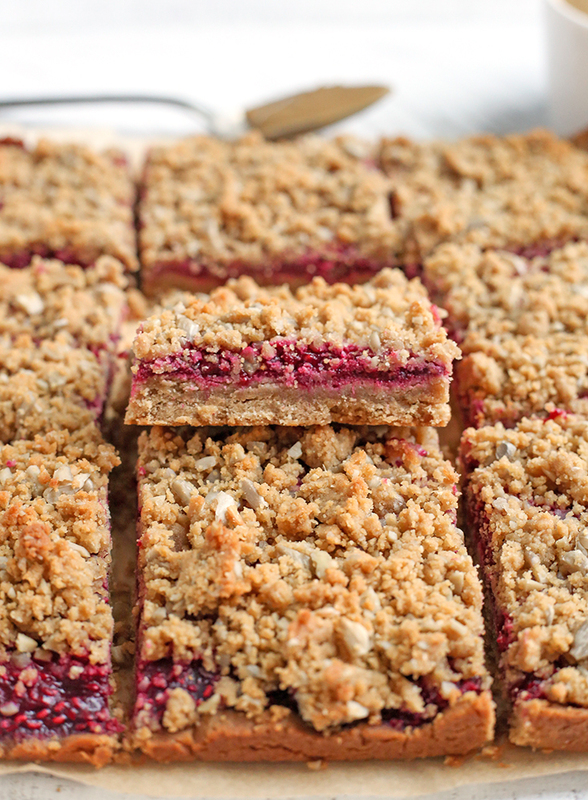 Sprinkle the crumb topping on top of the raspberry layer and press in lightly. Bake 20 minutes. These are best stored in the fridge.